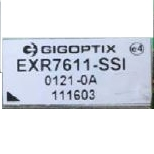 GigPeak - RFMW UK, Ltd.
GigPeak is a lead innovator of semiconductor ICs and software solutions for high-speed connectivity and high-quality video compression over the Network and the Cloud. They supply Trans-impedance Amplifiers, Optic modulators and millimeter wave semiconductors, and fab-less high speed semiconductor products for Fibre-optic networks and modules. Networks are migrating to speeds of 100Gbps, the business focuses on products such as Transimpedance amplifiers and Modulators for metro and long haul applications. As Radio backhaul moves to complement high data rate optics with E and V band radios – they have Transmitters, Receivers, Converters and LNAs to support these markets. The company offers Structured ASIC products to low geometry high end Standard Cells. The technologies supported range from 0.6um (5V) to 28nm. GigPeak ASIC technology started in 1989 with around 30 patents. Their extended product portfolio provides more flexibility to support changing market requirements from ICs and MMICs through full software programmability and cost-efficient custom ASICs.